December 23rd in Gennett History, 1924: Red Onion Jazz Babies recorded “Cake Walking Babies From Home” in NYC. It appeared on Gennett 5627, Silvertone 4029, and a ton of foreign reissue labels. It featured Eva Taylor and Clarence Todd (vox), Louis Armstrong (c), Charlie Irvis (tb), Sidney Bechet (cl), Lil Hardin Armstrong (p) and Buddy Christian (bs). 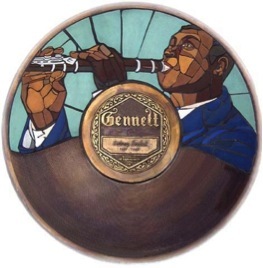 This entry was posted in December, Gennett, Gennett Walk of Fame and tagged Buddy Christian, Charlie Irvis, Clarence Todd, December, Eva Taylor, Gennett, Gennett 5627, Gennett Discography, Gennett Records, Lil Hardin Armstrong, Louis Armstrong, Red Onion Jazz Babies, Sidney Bechet, Silvertone 4029. Bookmark the permalink.